Simply speaking rhinoplasty is a medical procedure that reconstructs and/or corrects the form and function of the nose. Some people for example, have difficulty breathing through their nasal passages, while others may have a large or crooked nose that they find rather embarrassing. In either case rhinoplasty can provide a solution that fixes these types of nasal and nose problems. That’s what is rhinoplasty. The use of Rhinoplasty, as a surgical procedure, originates in ancient India and was developed by the physician Sushruta about 800 BC along with other plastic surgery techniques. From that point on those techniques were improved upon and hence have become a common form of corrective surgery for a variety of nasal defects. There are two types of rhinoplasty procedures. 1. Surgical rhinoplasty is an invasive surgery that repairs the function and appearance of a patient’s nose by manipulating the skin, the cartilage-and-bone of the nose, and mucous membranes. Almost all nose reconstruction requires surgery. 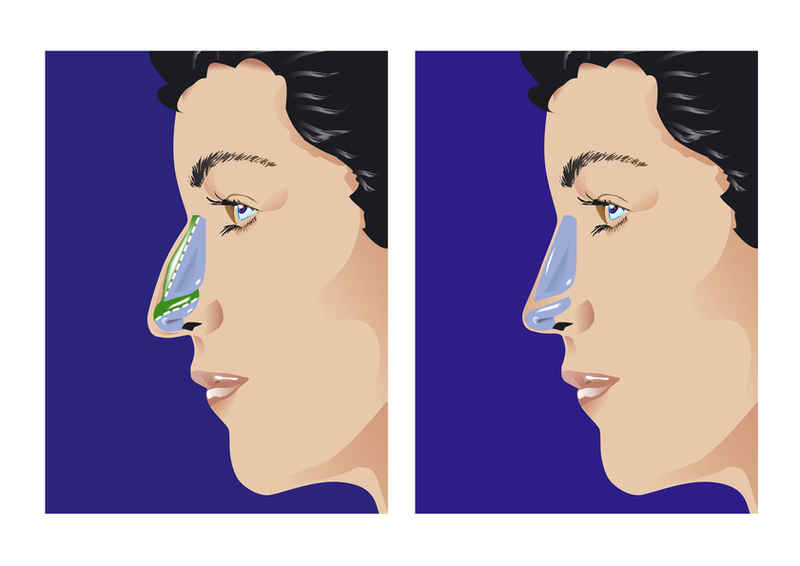 There are two approaches to surgical rhinoplasty. A. Open rhinoplasty – incisions are made from the exterior of the nose. B. Closed rhinoplasty – incisions are made exclusively within the nose. Although these two techniques are similar there are advantages to the closed rhinoplasty procedure, primarily that there’s a minimal amount of cutting and no visible scars. In addition, the recovery time is much faster as compared with open rhinoplasty. 2. As was indicated earlier, some people are not happy with the way their nose looks. Non-surgical rhinoplasty is the primary procedure used to improve how the nose appears. The physician utilizes a syringe and needle to inject soft-tissue fillers into pre-determined areas under the skin. Non-surgical rhinoplasty is sometimes used after a surgical rhinoplasty procedure. What is rhinoplasty recovery time? Patients of rhinoplasty surgery can generally return home following the procedure, unless there are complications or other medical reasons they can’t. But it’s important that all rhinoplasty patients rest and allow the healing of the nose. Although the patient can go outdoors after surgery the patient should take it easy for about a week. Generally, external sutures can be removed within four to five days after the procedure. Nose cast, if used, can be removed in about seven days, depending on the extent of the surgery, and stents (tubes inserted into the nose to help the nose heal to the proper shape and assist nasal air flow) between four and fourteen days. However, for the first year nose tissues can shift and tighten as they acclimate to becoming a new nose. What is rhinoplasty side effects? For the most part rhinoplasty is a safe procedure with few side effects unless of course the physician makes a mistake. But one of the most common side effects of rhinoplasty is what is called “panda eyes”. That is the patient will have black eyes for approximately two weeks before they completely disappear. Another side effect is that the nose, as it heals, can become irritatingly itchy. In some cases there is minor bleeding form the nose but rarely requiring medical attention. In closing we have seen what is rhinoplasty, but for more information contact your physician.